I was researching something to do with the boys locally and stumbled on the cutest blog on 15 things to do with your kids on Hilton Head Island. I loved the concept, but it was written in 2012 and some of the places she mentioned aren’t here any longer. 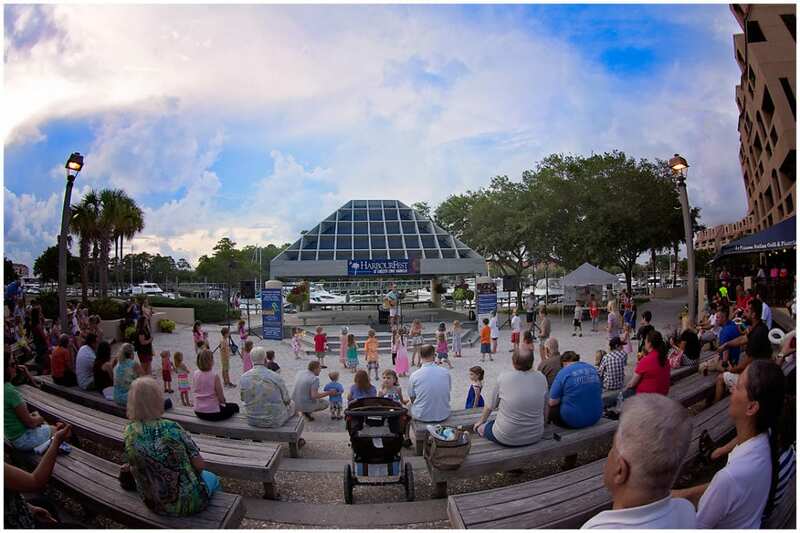 So here is my local update of 15 things to do with kids on Hilton Head Island! Go to the beach and play. This one will never ever get old. I’ve written a post on my beach tips with kids. Some locally loved beaches on Hilton Head Island include Burke’s Beach and Islander’s Beach! Islander’s Beach has a playground on site, and Burke’s has one within walking distance at Chaplin Park! Shannon Tanner y’all! He’s a Hilton Head Island treasure. 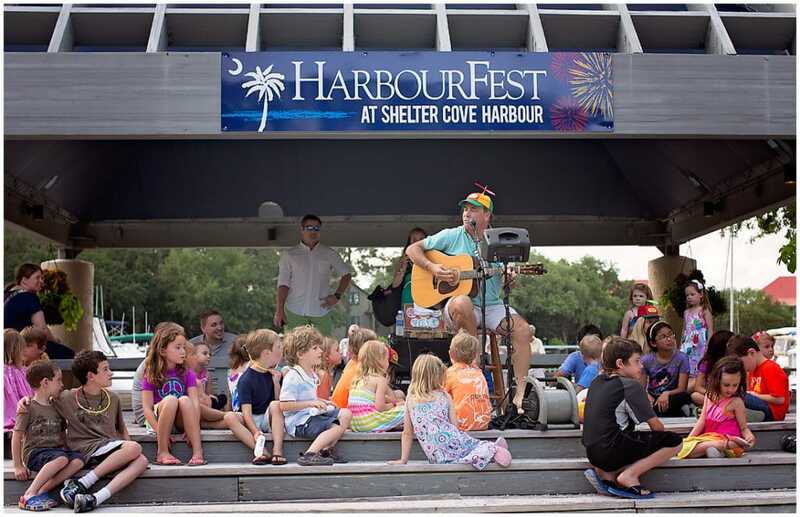 The Shelter Cove Harbourfest show is so much fun and caters to cute kids. Local tip, buy a bubble gun at Target before you go. The bubble wands are pricey there! His shows go Monday – Thursday during the summer. Tuesday is the busiest day because there are fireworks. Take a surf lesson or a sailing lesson, my daughter has done both. It’s incredible watching your child go from beginner to surfer or sailer. Surfer John is one of our favorite people in the world! Hilton Head Surf and Sail Lesson Information Here. Lawton Stables. We are a little partial to this sweet little stable by our home. It’s home to Callie the Deer and several beautiful ponies. You can do a trail ride through the beautiful Seapines Forest Preserve or your child can do a simply pony ride on site. The petting zoo is pretty cute too. You can also stroll through the Seapines Community Garden across the street. Seapines Forest Preserve is a fun adventure, you can hike through the trails to get to Indian Shell Ring and the Wildflower field. There is also a driving path, if you don’t have the time. There is also a fishing lake, beware of alligators! We live nearby and bike through frequently. I also just caught Pikachu there! Coco’s on the Beach is a small beach bar with a volleyball court, funky reggae, and great veggie burgers. Park at Hilton Head Resort, pay to park, then the bar will take your parking fee off your tab. Margaritas for mom and dad and smoothies for the kids! Golf Lessons. Seapines has a wide variety of family and kid golf lessons. Our island is famous for our golf courses, find out why!!! Bike Riding is so fun on Hilton Head, we have over 60 miles of bike paths. Bike rentals are affordable and it’s such a fun way to see the island. The lighthouse at Harbour Town! Go at sunset, you will thank me later. Not only is it cooler as you are climbing the staircase but the sun sets directly in front of the lighthouse. Harbortown also has a fun playground, beautiful scenery, restaurants, and shopping. Take a dolphin and nature boat tour. You can rent a boat or take a tour. There are so many dolphins around Hilton Head, it’s beautiful! 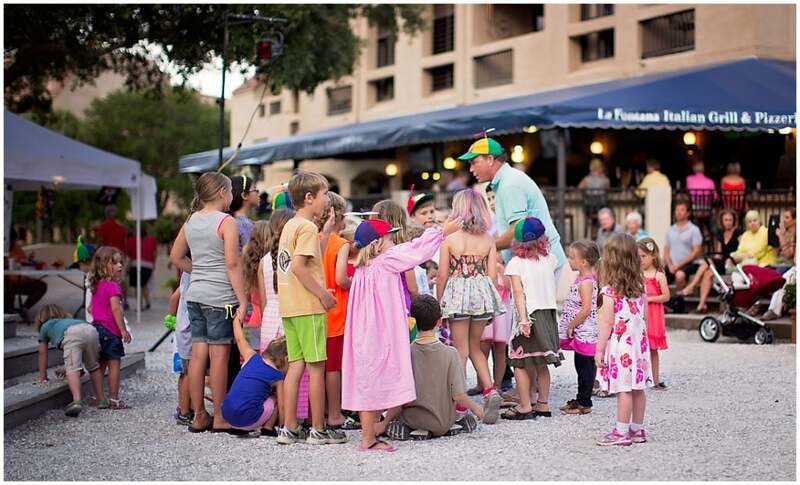 Coligny Plaza has live entertainment during the summer and my kids just love the fountains in front of Coligny Beach on a hot day! The Art Cafe is a fun spot to go on a rainy day. Skip buying a cheesy souvenir and make one with your family! The Sandbox is another good rainy day spot for young kids! It’s an interactive fun air conditioned play place! 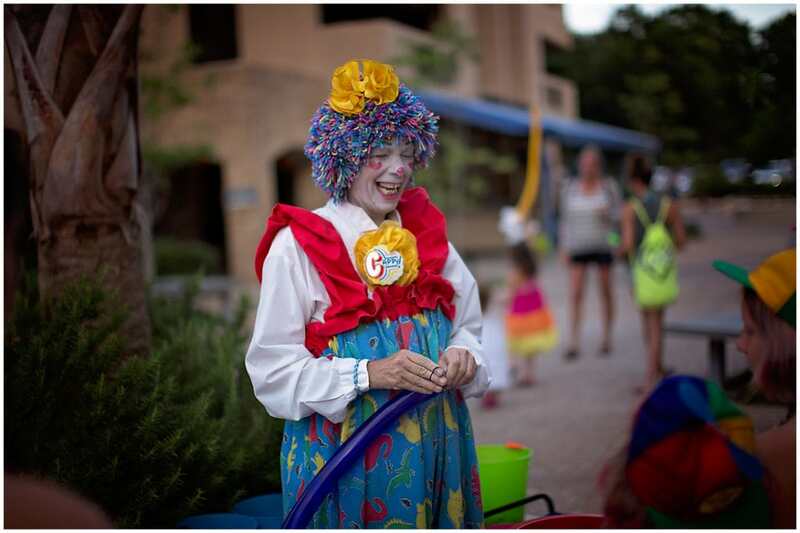 Shelter Cove has started doing Thursday movie nights in the summer. It’s so much fun, bring a picnic blanket and bugspray! The view is amazing and the kids can play and dance around. I know I missed a few. We have great shopping at Tanger and zip lines with a playground in the trees! But my kids hate shopping and I haven’t done the zipline yet. I need to fix that! 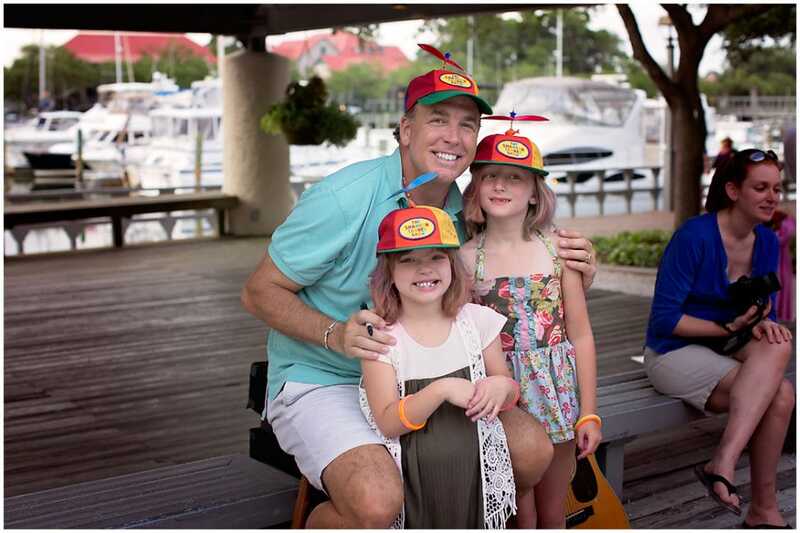 What did you do on your Hilton Head vacation with your kids? Did it rain during your trip? What rainy day activities did you do with your kids on a rainy day?